Where nature grows from the city’s concrete, is where you will find Seoul. This city is known to be extremely polluted and overcrowded, but many often struggle to admire the large amounts of green in the capital of South Korea. 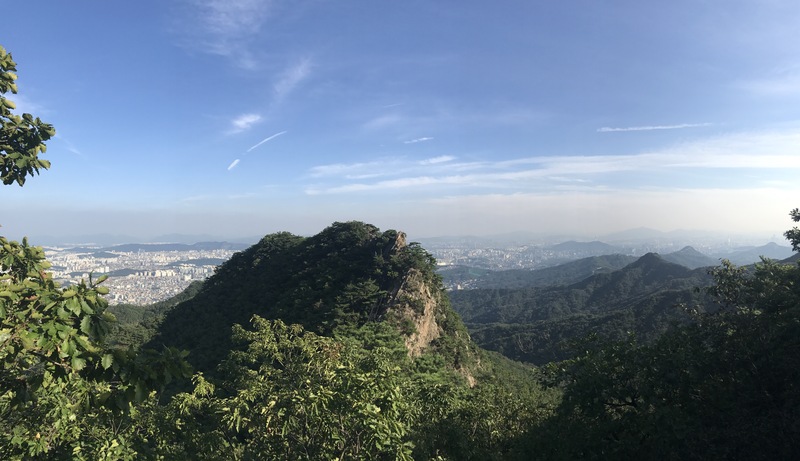 Despite it being a huge metropolis, you don’t need to go far to see nature in Seoul. It is surrounded by national parks and mountains which often function like an oasis in this city. A true place for people to escape the busy streets, overcrowded metros, and thick layer of pollution. 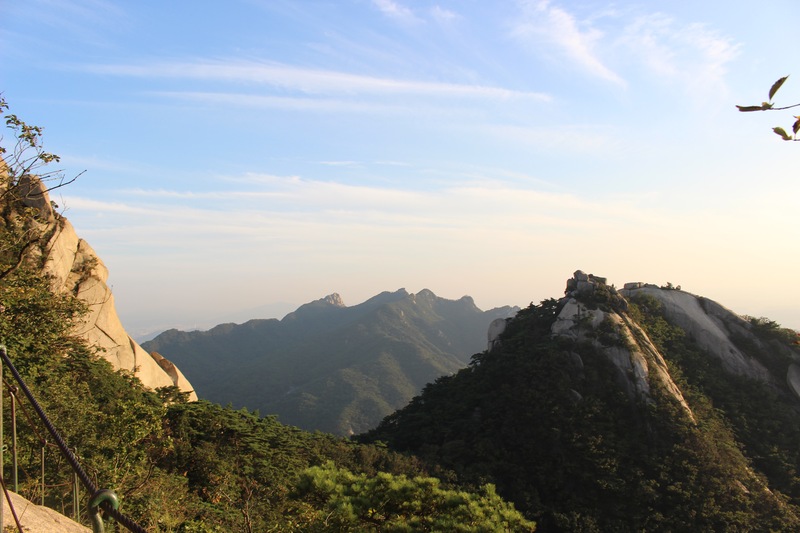 Bukhansan National Park is the home to Seoul’s three highest peaks and can be seen from almost anywhere in the city. Here is a story on one of my coolest adventures so far! Due to not being used to such heavy pollution, I decided to catch up on some proper fresh air in Bukhansan National Park, one of the biggest parks in this country. Holly, an exchange student from Exeter, and I, challenged ourselves to go for a hike in this area. Having climbed Ansan Mountain right by campus in only 40 minutes, we were ready for an upgrade in terms of climbs. 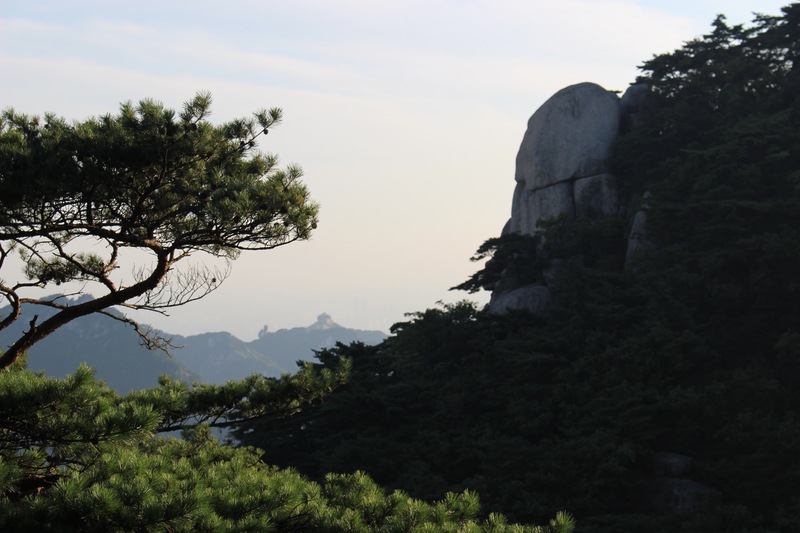 Not knowing Bukhansan National Park was on the other side of the difficulty spectrum. After only having spent an hour in the bus, we reached an information centre on the south east side of the park at around 3pm. As we looked at the large map of different peaks within this park, we purposefully looked for the highest one and pointed at it. The girl at the information centre gave us a significantly smaller map, drew out the route, looked at her watch and told us we were a bit late. 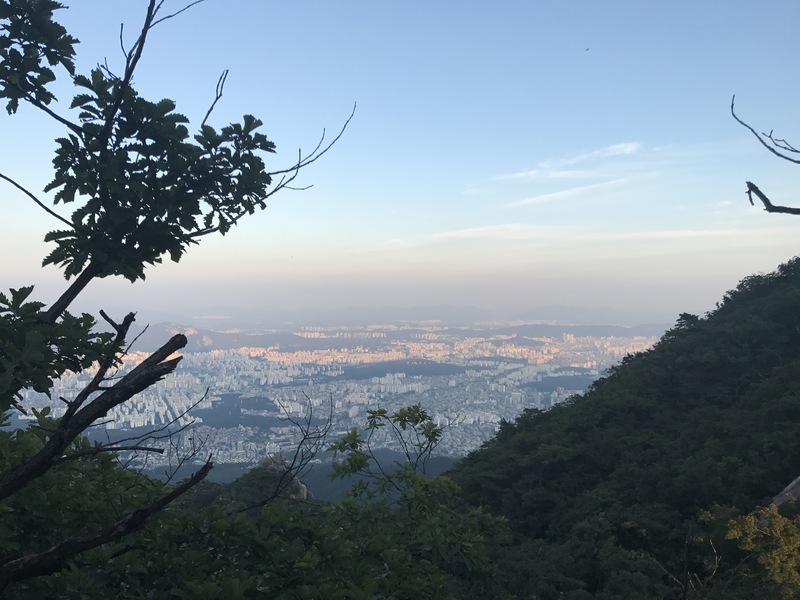 The hike to Baegundae peak (836.5m), Seoul’s highest point, was supposed to take us three-and-a-half hours. This would mean we’d make it just on time for sunset. It was game on from now. We were brave enough to pick the highest peak, but what good would it be if we would have to turn back down because it was getting dark? As we stocked up on water, the biggest apple’s I have ever seen, and some strange looking seaweed chips, we felt confident that we were going to accomplish this ridiculous challenge we had set ourselves to. 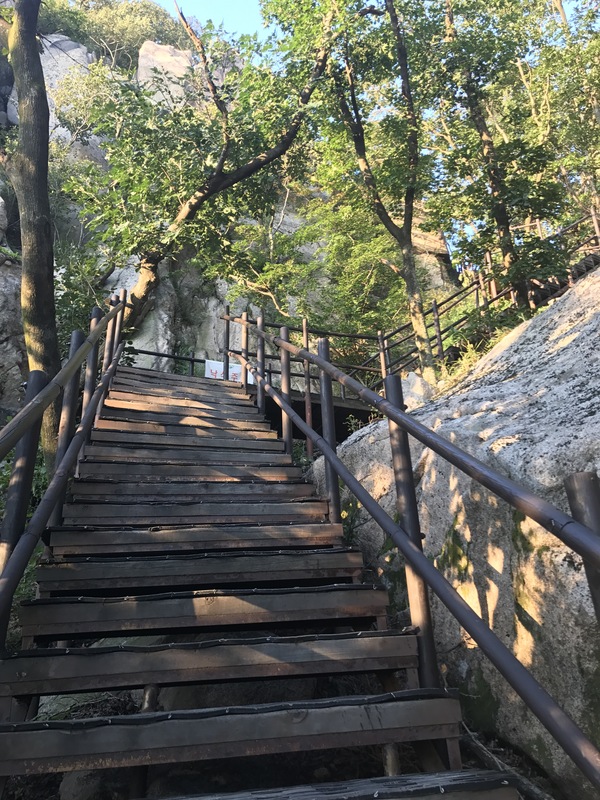 Indeed, the toughest climb of Seoul! Our route consisted of four different categories, respectively: amateur, intermediate, advanced and expert. The first one we didn’t see much of, as the nice walk along a fresh water stream at the bottom of the park soon turned into steep climbs on a very very long set of irregular stairs, causing us to misstep almost all the time. Making very little progress on the map and often struggling with navigating our way to the checkpoints we had set ourselves, gave us little hope that we were going to make it to the top on time for sunset. Time was ticking as we enjoyed our short stops with breathtaking views, not knowing that it was going to be ten times better at the top. With every view we could get, we’d stop, admire the view, take pictures and just feel the goosebumps form on our arms of amazement. Nevertheless, our route soon turned into intermediate and advanced level, resulting in us taking even more breaks to catch breath, have a sip of water or quickly still shoot that amazing view with our phones or camera. 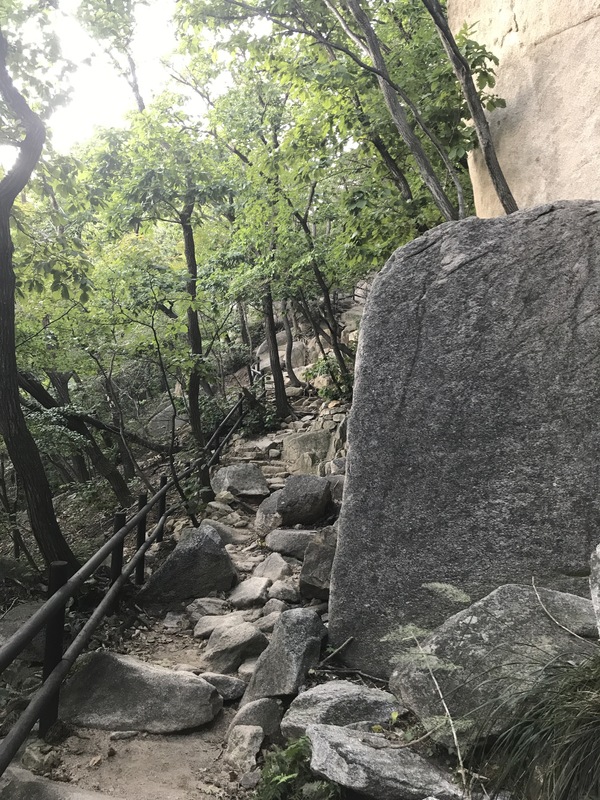 The irregular sets of stairs suddenly turned into narrow paths along mysteriously large and weirdly shaped rocks, leaving us wondering how they ever got there. At times it was tricky to identify where the path was going, and whether we were even still on a path, but by spotting emergency posts and the occasional map with a “you are here’ sticker gave us reassurance again. When we spotted a gate hiding behind a few trees, we climbed up it, sat down and took a good 20-minute break, to indulge in those massive apples and seaweed snacks. They weren’t as bad as I had imagined them to be. Either way, the view was pretty impressive, looking over the North East and South East of Seoul, parts I hadn’t seen or been to yet. Anyhow, the thick layer of smog sitting just above the city was very clear. It felt incredibly good to step out of that and breathe in some proper fresh air. Once I felt satisfied enough with the pictures I had taken and finally managed to finish the apple, we continued along the fortress wall right by the gate. 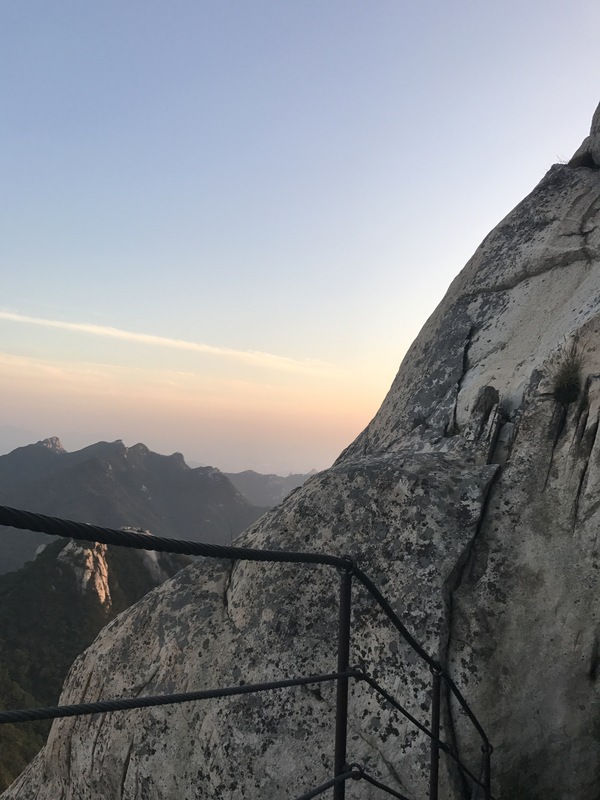 Steadily making our way up, our muscles were slowly starting to sore, but with every step we took we knew we were getting closer to our goal; Baegundae peak for a sunset view! The fortress wall disappeared rather soon after we continued from the break we took, and paths changed completely. From walking irregular sets of stairs, to slaloming through rather big rocks, we now found ourselves holding onto wire ropes at waste height as we pulled ourselves up over smooth rocky terrains. Every now and then a set of stairs would relieve the fear of slipping and falling down. The height of the wire ropes often dropped to knee height or raised to about shoulder height, making it very dangerous and easy for me to either fall over or under. Thank god I still had at least a little bit of strength in my arms and legs to keep going! Paths as such continued for quite a while until I spotted a South Korean flag waving on the very top of what looked like Baegundae peak. One part of me was secretly hoping that was the peak we were aiming for, simply because it looked fascinating and I could imagine the view. The other half of me was hoping it wasn’t the peak we were headed towards, only because it seemed far away and almost impossible to get up. Our route took a rather steep decline suddenly, having me think we were heading for another peak in this insanely quiet and clean national park. 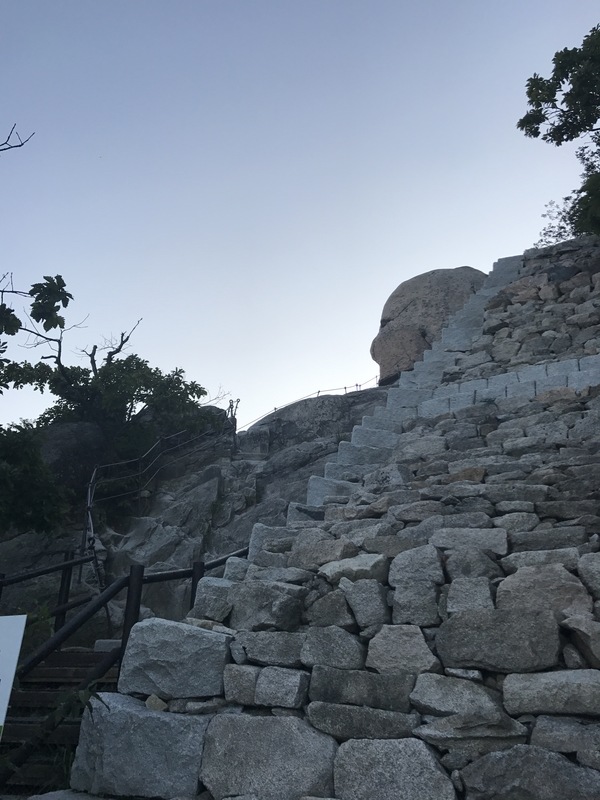 But then, a very long set of regular stairs appeared, leading to another gate, with a big “Baegundae” sign point to the left. Out of excitement Holly and I almost ran up the stairs before we were halted by a Korean hiker who was on his way back down. After about 10 minutes of using Google Translate and clearly telling the guy we didn’t understand him, we figured we’d just keep moving. He could have warned us that it was too dangerous for all that I know, but nothing was going to stop us from reaching Seoul’s highest peak. We were convinced that as soon as we turned left at the gate, it would only be stairs from there. We were horribly wrong. It was one very steep climb along the slope of the peak, with just a wire rope to our left. Due to safety rules and regulations, such paths simply don’t exist in European National Parks. Here, one slippery wire rope seems to be more than enough. And so we gave it a shot! Step by step, breathe by breathe, and heartbeat by heartbeat, we slowly and extremely carefully pulled ourselves up. My hands were sweaty and my shoes had lost the majority of their grip, so I often felt myself sliding back down. I don’t think my heart ever skipped a beat as often as it did that evening. By now, we had figured this had to be expert level, because it couldn’t get much tougher than this. “Don’t look down” and “you got this” were the two phrases we kept telling each other. Indeed, looking down was a terrible idea! With sweat hands, spaghetti arms and shaking legs, we got to where we wanted to be just on time for sunset. Due to not having the appropriate shoes with me, I had to end my climb a little sooner as Holly stumbled to the very top of the peak. I didn’t feel like risking my life just yet. The view was alright from where I was sitting too. As I watched the night sky conquer the city’s skyline, the sun set right behind Baegundae peak. What a feeling it was! 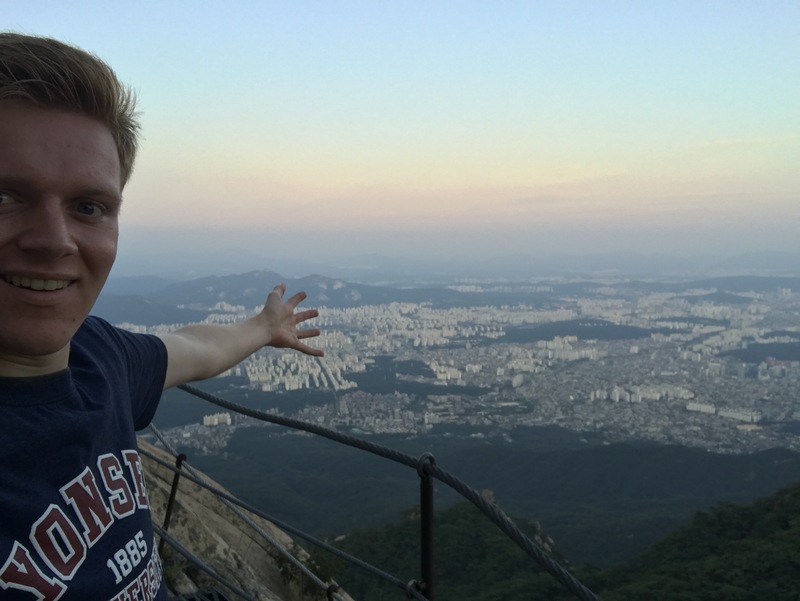 The top of Seoul, there was no one else, and the view was absolutely spectacular. The hike down, however, took a little longer than expected. At the information centre we were told it would not take us longer than 40 minutes if we took the route that was drawn out on the map we received. By the time we had gotten to the bottom of the peak, it was already getting dark and we took a right too soon. Our so planned 40 minute walk down soon turned into a good 2 hour walk down stairs, rocks and across waters through mosquito lane. We were being eaten alive as we dodged glow-in-the-dark spiders, unnaturally looking flying insects, and purple moths the size of golf-balls. I thought such creatures only appeared in the weirdest fiction movies. Guess I’m horribly wrong! As we finally caught a glimpse of civilization again, we felt extremely relieved and started looking out for busses. Shops and restaurants were closing in this area, which is quite unusual for Seoul at around 9pm on a Friday evening. This made us realize how far out of the concrete jungle we were. About a good 50 minutes by bus. The first bus we saw was the one we needed, so we hopped on, claimed two seats each and opened the windows. I don’t know about Holly, but I smelt horribly and I didn’t want anyone to suffer from that smell, so I opened the window as wide as I could and sat back, as I let the cold air blow through my hair. Whilst observing the night life, my mind was still spinning from that incredible hike earlier. Our next goal was food! Anything, I didn’t care, as long as I could eat something. 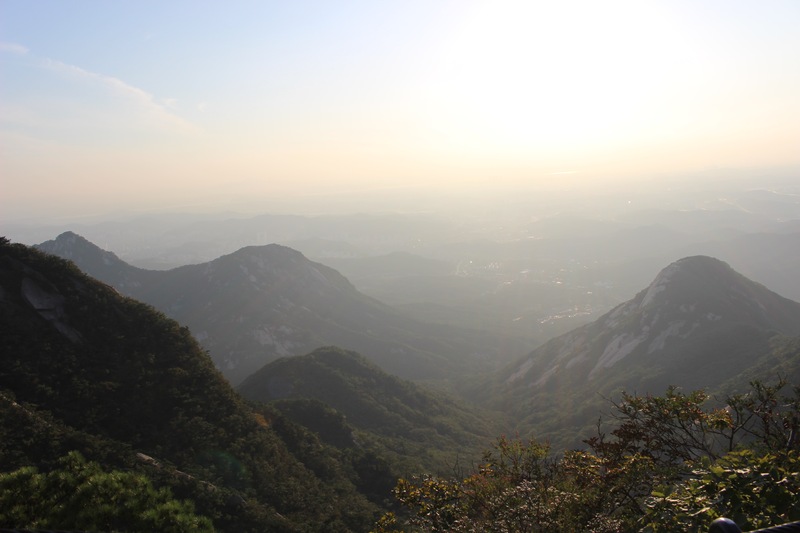 What better time to have street food for the first time in Seoul than after a hike like this? Fried shrimp, octopus, ridiculously spicy rice cakes, and whatever else the lady at the stand had given us was a brilliant treat to our 7 hour hike! It wasn’t till after some proper stretching and a long warm shower back in the dorms that I realized how unique the hike was. There were times where either of us could have easily slipped and fallen to death, or paralyzed ourself for life. When we climbed that final part, I realized how dangerous it was, but it only really hit me when I got back to my room. As much as it was an adventure of a lifetime with memories I will never forget, it was also a matter of life or death when we were struggling on the expert trail. Either way, 7 hours of my time in Seoul very well spent! Another experience in the pocket, and, by far the coolest selfie I have ever taken!